This book discussed fundamental problems in dynamics, which extensively exist in engineering, natural and social sciences. The book presented a basic theory for the interactions among many dynamical systems and for a system whose motions are constrained naturally or artificially. 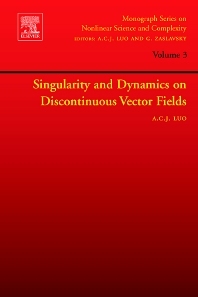 The methodology and techniques presented in this book are applicable to discontinuous dynamical systems in physics, engineering and control. In addition, they may provide useful tools to solve non-traditional dynamics in biology, stock market and internet network et al, which cannot be easily solved by the traditional Newton mechanics. The new ideas and concepts will stimulate ones’ thought and creativities in corresponding subjects. The author also used the simple, mathematical language to write this book. Therefore, this book is very readable, which can be either a textbook for senior undergraduate and graduate students or a reference book for researches in dynamics. Mechanical Engineers, Control Engineers, Physicians and Mathematicians. Also for Bio-Physicians, Managers and Students. Albert C.J. Luo received his B.S. in Mechanical Engineering (1984) and M.S. in Engineering Mechanics (1990) in China and Ph.D. in Applied Mechanics (1996) in Canada. During 1996-1998, he was an NSERC (Canada) post-doctoral fellow at UC Berkeley. From 1998-present, Dr. Luo have worked at Southern Illinois University Edwardsville as Assistant/Associate Professor. During 20 year research experience, Dr. Luo developed stochastic and resonant layer theories in nonlinear Hamiltonian systems; a local theory for non-smooth dynamical systems on connectable domains. In addition, Dr, Luo also developed an approximate plate theory; a large damage theory for anisotropic materials and a generalized fractal theory. He has published over 130 peer-reviewed journal and conference papers. Dr. Luo has served editors for the Journal “Communications in Nonlinear Science and Numerical simulation” and two book series on Nonlinear Science and Complexity. Dr. Luo is the editorial member for IMeCh E Part K Journal of Multibody Dynamics and Journal of Vibration and Control. He also organized over 10 international symposiums and conferences on Dynamics and Control.